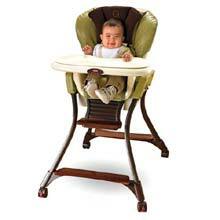 All the conveniences you look for in a high chair combined in an upscale look with rich textures, earthy colors and beautiful wood accents to help create harmony in your home ? especially at mealtime! Features include: three-position reclining seat; three adjustable height positions; tray that removes easily with just one hand; dishwasher-safe feeding tray insert; and a dishwasher-safe five-point harness to keep baby securely in the chair. The chair's seat padding is made of a wipeable leatherette material for quick clean-ups. A machine washable suede seat insert pillow is included to help position for younger babies. High chair folds for storage. 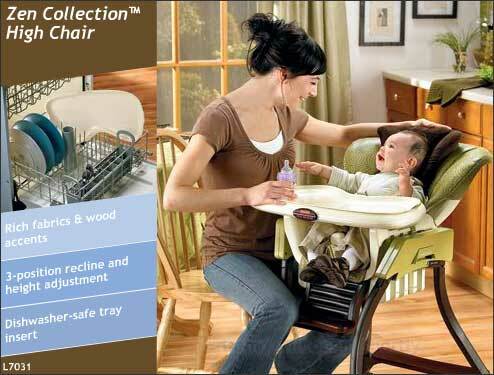 The Zen Collection High Chair from Fisher-Price lets you add rich textures, earthy colors and beautiful wood accents to your kitchen while providing your baby with all the conveniences you look for in a baby chair. Featuring an upscale look designed to create harmony in your home, this chair is designed for children weighing up to 50 pounds. The Zen Collection High Chair features richly textured fabrics for comfort and style. View larger. Boasting a unique sophisticated furniture look that complements any decor, this high chair features wood accents on the base front and back as well as the footrest, and touchably soft suede fabric that wipes clean and is also machine washable. As comfortable for your child as it is stylish, the Zen Collection offers a three-position seat recline and three adjustable height positions to accommodate a growing child. Nothing is more important than baby's safety. That's why the Zen Collection includes a five-point removable harness system that secures baby in his seat during meal or snack-time. This harness is also dishwasher safe for quick and easy clean-up. You can remove the tray with just one hand and pop it in the dishwasher as well. When baby is done, the Zen Collection folds down for convenient storage. The Zen measures 26x40x34 inches.